Disclosure — We must prevent unauthorized access to the content of syslog messages, as some may be sensitive and useful to an attacker. Modification — We must prevent modification of a syslog message in transit, as this could hide an attack or cause analysis to lead to undesirable events. Masquerade — We must not accept syslog messages from unauthorized sources, and they must not be sent to unauthorized collection points. We will also be secure against the secondary threat of message stream modification, in which individual messages might be deleted, re-transmitted, or re-ordered, as our Syslog messages will be sent through an encrypted stream protocol. Two lesser malicious threats remain: denial of service in the form of a data flood and traffic analysis in the form of analyzing the mesh of Syslog sources and collectors. Our concern about malicious denial of service is limited to two cases: one of our own system administrators going rogue (and in that case we have bigger things to worry about), and attacks by third parties against our publicly reachable Syslog collection servers. As for traffic analysis, the only concerns would be surveillance in preparation for a denial of service attack, and attempts to discover system relationships we had hoped to keep covert. However, if our systems are all deployed throughout Amazon's Elastic Compute Cloud (EC2), then only Amazon and Internet backbone providers present a traffic analysis threat. Data availability cannot be guaranteed, and without mathematical (that is, cryptographic) tools we cannot specify just how available a data set will be. So, to do what we can, we will use "live" distributed logging, sending log messages as the events happen to multiple geographically distributed collection points over channels cryptographically protected against disclosure, modification and masquerade. Here are the hosts. One of them, our Certificate Authority or CA, should not be out in the cloud. All of our cryptographic security relies on the CA machine's data confidentiality, data integrity, and user authentication. Be very careful with this one! The log sources are the servers doing the company's work. The log collectors keep the company compliant. Nothing is perfect, including the availability of Amazon Web Services. However, it seems that the significant outages have mostly been limited to a single availability zone. There was a DDOS attack against a range of IP addresses in the US-East region on 1 Dec 2010 in retaliation for Amazon pulling its service to Wikileaks, what Amazon has described as a "mirroring storm" with one availability zone in US-East on 21-25 Apr 2011, a power outage in one availability zone in EU-West on 6 Aug 2011, and a network connectivity outage for 25 minutes within US-East on 8 Aug 2011. The log message sources and collectors could be anywhere, but in my example they are all instances in Amazon's EC2 cloud. 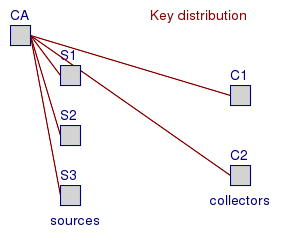 The collectors are not co-located with each other or with any of the sources. Amazon has a number of geographic regions at the time of writing this: US-East, US-West-1, US-West-2, EU-West, Southeast Asia, and Northeast Asia. These nominally correspond to Virginia, the San Francisco Bay area of California, Oregon, Dublin, Singapore, and Tokyo, respectively. Each region has multiple "Availability Zones", and while it isn't clear just what a given Availability Zone means in terms of geography, we can put our log collectors in geographic zones shared with no source or other collector. The CA will first generate its own signing key and corresponding self-signed certificate. It will then generate key pairs and corresponding CA-signed certificates specifying the public keys. The CA's public key certificate and the host keys and certificates will be copied into place, as shown here. 1. x509/name — Certificate validation and subject name authentication as described in IETF's Internet draft draft-ietf-syslog-transport-tls-12. 2. x509/fingerprint — Certificate fingerprint as described in IETF's Internet draft draft-ietf-syslog-transport-tls-12. 3. x509/certvalid — Certificate validation only. The problem as I see it for x509/name is that I would need to create a unique certificate for each host deployed. But one feature of the cloud, to many people one of its strongest points, is the ease and speed of deployment, use, and termination. It's as easy to start arbitrarily many instances simultaneously as it is to start just one. Either way, it's just a matter of clicking through a few screens and entering either "1" or a larger number on one of them. Then you just wait perhaps another 20 to 30 seconds for your new host(s) to be copied into place and booted up. It would take me longer to generate a digital certificate for just one of them, much longer yet if the CA machine were not accessible across even an internal network, a likely situation if you're being truly careful about your core CA host. The x509/fingerprint authentication does not seem to me to provide significant security beyond simply verifying that the certificate offered by the remote host is valid (based on a test with a CA public key believed to be valid) and then requiring the remote host to authenticate itself within the TLS handshakes. So, I will show you how to set this up with x509/certvalid host authentication. TCP port 6514 has been allocated as the default port for Syslog over TLS. Each source host will initiate a TLS handshake with all configured collectors as soon as it happens to have something to log — which happens to be the event of starting its local Syslog service. The TCP connection will stay up, being re-established as needed due to network timeouts or the Syslog service being stopped on either the source or collector. We will configure our sources to log one marker message every 60 seconds, providing a means of continuously verifying that event logs are being captured. That's enough background, let's do this! 1. Generate a private key. The private key must be safely stored on the CA host so that no unauthorized parties (and that means pretty much everyone) can read it. 2. Generate a self-signed certificate from that. The self-signed certificate will be installed on our other hosts. It is self-signed in the sense that the CA host is effectively saying "This is my public key, and you should believe that it is my public key because I say it is, and I am the source of information about keys." Your choices for sec-param are: low (1248), normal (2432), high (3248), and ultra (15424). That command will ask you a sequence of questions. You will probably want to make it last for a long time before expiring. It uses units of days, 3650 would mean about ten years and 7300 would mean about twenty. Answer the other questions as needed for your situation, but answer "y" to the question "Does the certificate belong to an authority? ", specify -1 (no constraint) for the path length, and answer "y" to the question "Will the certificate be used to sign other certificates?" As I explained, I am going to use certificate validation for authentication and authorization. Furthermore, I am going to trust my system administrators not to be security risks for denial of service, which they could do by either copying key and certificate information to other hosts under their control or by giving that information away to others. Finally, these keys and certificates will be used only for the Syslog/TLS project, not for any other host or user authentication. Generate a key signing request. Most of the Y/N questions will be N, the default, but answer Y to it being both a TLS web client and server certificate. The file ca-key.pem is the extremely sensitive one. It might make sense to run your CA on a host that is not connected to a network, using a USB thumbdrive to export data from it. And, of course, your CA should not run an operating system that does silly things like automatically run executable files found on removable media. Move the files ca.pem, cert.pem, and key.pem to a workstation on your network. The file key.pem is the most sensitive of these, as an attacker with that file could masquerade as a legitimate source of log messages and launch a data-flooding denial of service attack. Leave it on the isolated and hardened CA system. In theory, the same attacker could masquerade as a legitimate collector of log data, but this would require either taking the place of a log collector or misleading the administrator of a log source into configuring that system to also send log messages to the attacker's machine. These seem unlikely enough that I don't see the point in worrying about them. If you want to worry about them, you are going to have to use full name-based authentication and generate a unique certificate for every cloud server you deploy. I had downloaded the Amazon EC2 API tools, a collection of command-line tools that allow you do to things like upload (import) public keys. Generate a key pair with ssh-keygen, being careful to specify that the new keys should not be stored in the default location of ~/.ssh/ but instead somewhere like ~/.ec2. The files are id_rsa and id_rsa.pub for the private and public keys, respectively. At that point, the user has unlimited privileges on that one instance. Your corporate account with Amazon, and thus the ability to deploy servers and incur corporate costs, is used to authenticate to the AWS management interface. This could be the AWS Management Console web interface, or it could be the command-line EC2 API tools. For the web interface you interactively enter an e-mail address and password. The command-line interface uses the private key specified by the EC2_PRIVATE_KEY environment variable, which typically specifies ~/.ec2/pk-*.pem. A provisioner authorized to spend corporate money is given this key. User identities are used to authenticate to deployed servers, as the system administrator on some images or as a privileged user who can trivially become the administrator on Amazon Linux images. The credentials might conveniently be ~/.ec2/id_rsa and ~/.ec2/id_rsa.pub for the private and public keys, respectively. Users trusted to administer individual cloud servers are given this key. In the interest of security, compartmentalize administrative access to your servers by generating multiple SSH key pairs with ssh-keygen, uploading all the public keys to the AWS cloud under meaningful names, and carefully distributing the private keys to your administrators. The private key needs to be on your desktop, but the public key must be uploaded to AWS so it can be installed on newly deployed instances. Upload one SSH public key to all the AWS regions, and use the corresponding private key for all authentications into the cloud servers. Use something more imaginative than "keyname" for the key's name — this is the name of the user credentials you will specify when deploying a new instance. Deploy your cloud servers, both the Syslog sources and the collectors. Log in to the AWS Management Console, select a geographic region and go to the AMIs view. For the log collectors, select Amazon Images and then Amazon Linux in the pull-down menus. Then narrow the search by typing i386.manifest in the search box. You probably want a production image, not a release candidate or a beta test version, with either rc-N or beta in its name. Select one and start to launch it. The smallest instance size will be more than enough for this. It will probably be helpful if you give each machine a meaningful name in the screen where you can set up key-value pairs. Something like Virginia Collector or Dublin Logger. This happens on the second screen of the Instance Details section of the process. As for the Security Group, Amazon's term for firewall rule set, the collectors only need to allow connections over SSH (TCP/22) and Syslog/TLS (TCP/6514). Repeat as needed to deploy your cloud servers, which will be the log sources. Select whatever image you need to get the job done. Specify Security Groups (firewall rule sets) in terms of whatever they need to accomplish. They will be able to establish their own outbound TLS connections regardless of the inbound rule set. Also give them meaningful names, like Tokyo Server 1 and so on. drwx------ 2 root     root     4096 today 15:35 .
drwxr-xr-x 8 root     root     4096 today 01:29 ..
Now go back up to where this page says "In every one of these windows" and do the key file moving and ownership change, and the immediate and permanent host renaming on all the other cloud servers. Alternatively, you might do this one step at a time in each of all those colored X terminals. Save a backup copy of /etc/rsyslog.conf somewhere, and then edit the file to make it look like the below. Yellow highlighted sections are what I added or changed. Blocks that were entirely commented out in the original have been deleted. ## Load the TCP listen module, and use the gtls driver by default. ## certificate itself but not insist that the name match. ## Also keep a copy of everything in one file. ## Bind the RuleSet to the TCP listener and start the listener. Restart the service and verify that you see no error messages. Fix your configuration as needed until it restarts cleanly (I have broken the log lines for display here). Also make sure that it is listening for connections. If syslog-tls is not listed in your /etc/services file and this lsof command produces an error, use tcp:6514 instead. Oct  7 01:09:32 collector-virginia kernel: Kernel logging (proc) stopped. Oct  7 01:09:32 collector-virginia rsyslogd: [origin software="rsyslogd"
# Mark the log file every 60 seconds to ensure it's still alive. ## How and where to send messages:  Mode=1 means TLS-only. Oct  7 01:17:57 server-japan-1 kernel: Kernel logging (proc) stopped. Oct  7 01:17:57 server-japan-1 rsyslogd: [origin software="rsyslogd"
Oct  7 01:17:58 server-japan-1 rsyslogd: [origin software="rsyslogd"
Also verify that lsof -i tcp:syslog-tls shows that it has an established connection with each log source and it is still listening for more connections. From your desktop system, make SSH connections to your cloud servers (the syslog sources). Also make some that intentionally fail, by using the wrong key, not using a key at all, or specifying a bogus user name. Then verify that all of that activity was captured in each server's dedicated log and in the big unified one. If it is ever the case that one of the files /var/log/server/* is more than 1 minute old, then some remote logging process has died. Be aware that logs will automatically be rotated at 0400 UTC every Sunday morning. See the logrotate.conf file to modify how many old copies it keeps around, whether old versions are compressed with bzip2, and so on. Log files tend to have enough redundancy to compress to just about 5% of their original size. A scheduled job inside your organization could automatically pull down the newly archived compressed logs from the previous week at, say, 0500 UTC every Sunday morning. A cautious script would then verify that the download worked and that it contains the expected data. Now you're ready to do some log analysis with awk and sed, or maybe with perl, or with higher level tools.